PokerStars and the fans have been treating me very well. It's fantastic to be a member of the Online PokerStars team, I feel like signing a contract with them is for the world of Poker the equivalent of getting a contract with Real Madrid in the world of football! I played 9 hours and when I went to bed I was feeling completely exhausted! The results were great and I advanced a bit in the challenge. I needed to start being more careful with the number of tables that I play, because at some point I was playing 30-35 and I was playing bad, so I went down to 20-24. I wasn't sure if I was going to play the following day, cause I was too tired from that day's grinding and I didn't think there would be any interesting games, but if I found 12 tables of $88 at some point, I would have to play unless they had 4 winning players registered or something like that. On the 16th day I didn't play, the truth is there weren't many games running and I needed to relax a bit. 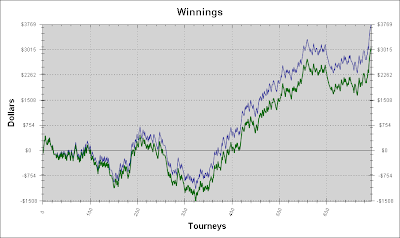 From that point on I decided to play only if I could do 12tabling, cause that is a sub-optimal way of using my time. On the 17th day I played 2 and a half hours and it went well. After that, I spent another 2 and a half hours studying. The challenge is running well, even though I'm a bit discouraged when it comes to my game level cause I have been playing the same stakes for a few months now, so I'm thinking about what I can do to increase my hourly rate. In the future, my priorities are going to be finding new ways to study and correct my mistakes as well as how to chose well the games and the stakes I play. 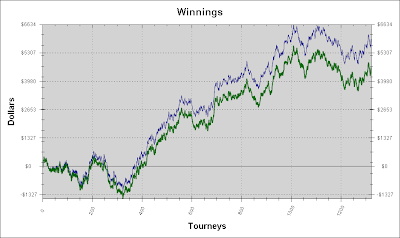 As I have already mentionned, until the end of the month I'm not going to play any sng of over $200 and I probably won't do it before the end of the challenge either, but afterwards it's going to be one of my goals to beat the higher stakes. 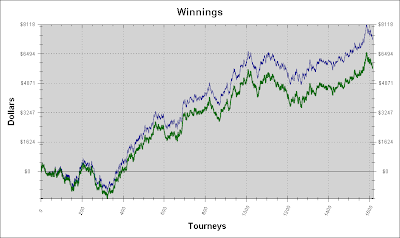 I played the satellite hyper-turbos for the scoop-31m for a few hours and then satellites for higher tournaments. Unfortunately, I bubbled 3 or 4 satellites that gave 4 digit prizes to the next finishing place and that affected a lot my results for the day. 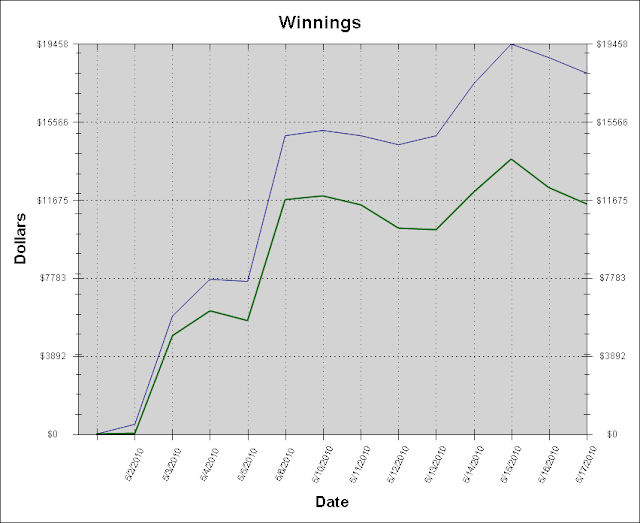 I also played the low and medium main event: I finished itm at the low and I lost early at the medium. For whoever watched me play that day, the play where I called vs 2 players with 99s was a mistake... The range of the player with 30BB was something like TT+, AQ+, so I needed AK/AKs, JJ+/QQ+. It was a very interesting experience playing that $109 tournament. Some plays worked, some others didn't, but I played quite a bit and I think that is the level for me. If I wanted to play mtts regularly and get better, I believe I could start at the $109/$215 until I managed to beat that level. 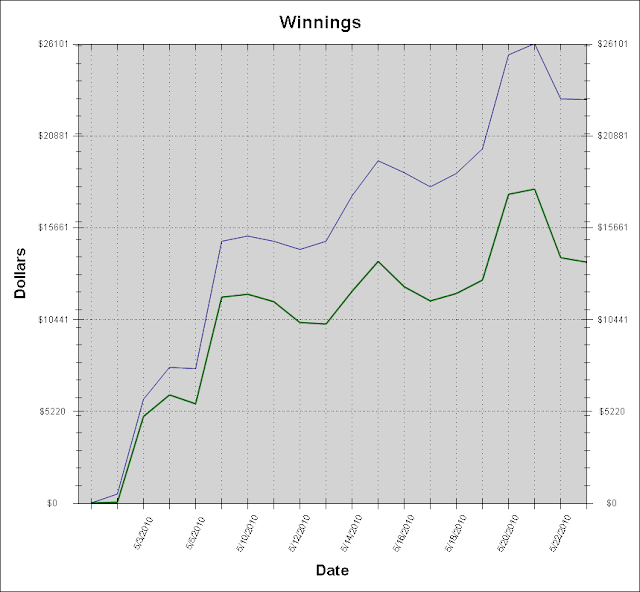 It's not easy to write this, but at this moment I am sure that I'm a losing player in any field of $530+ online mtts. I think I can get to be a winning player at this format, but only if I dedicate myself to it and at this point that would be a stupid thing to do with the values that I am winning while playing my sngs. I am going to stop playing the Sunday Million on Sundays since it starts at 23:30 greek time and it seriously affects my working schedule. In relation to the challenge... I have already passed 25% of the time and it's a good time to have a look at the numbers and what happened until now. I have a profit of about 18k, or 30% of 60k, that are excellent numbers, but right now a new phase of the challenge is going to start. It is going to be more difficult to keep up the pace cause there won't be any $90 satellites for the scoop tournaments. 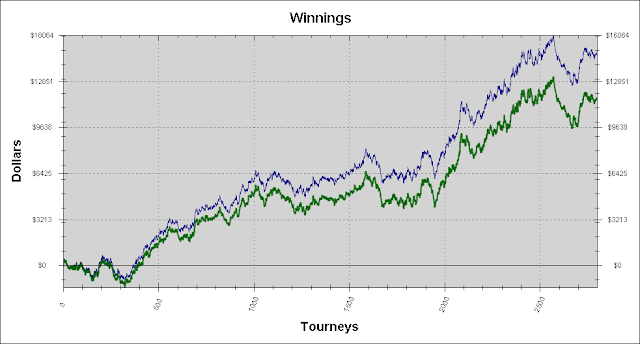 Until the end of the month I will not play any satellites of more than $200, in order to reduce the variance. That is because I need to make a table selection for those and the sample that I play is very small. I played 6 and a half hours, I finished positive at the hyper-turbos, I lost 6 180_$36 and I won quite a lot at the MTT satellites for the scoop tournaments. I won one that had a $550 buy-in and gave $2600 to the top11 and another one that was $98.5 and gave $270. I reached 20k in the challenge which is 1/3. I didn't want to play the main event that day cause it was late and lasted a lot of time, but I wanted to play a lot of satellites and try to progress as much as possible in the challenge! This week, the tournament will start at 21.30 GMT and there will be the usual prizes. PokerStars will give to all players that make it to the final table a ticket for the Sunday 1/4 Million that will be credited to their account during the following week. On the 12th day I didn't play, I took the day off and I went to the cinema. I watched Iron Man 2 and I found it worse than the first one. 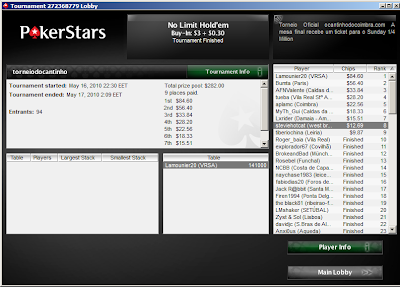 The next day I planned to play the satellite for the scoop38-m of Supernova, that would have 6 entries offered by PokerStars and cost 8k FPPs. Depending on how the hyper-turbo satellites would be, I was going to play some of those as well. I was undecided about playing the scoop38-s because I woke up at 12 and the tournament was starting very late for me, but that was something I could decide on later during the week. On the 11th day I played 2 hyper turbos of $430 each, that had three registered players and I couldn't resist... (it is in my bankroll anyway). Unfortunately, I lost at both. I also played some $220s when the games where more accessible, but I didn't succeed in making profit out of them. At some point I remembered a conversation that I once had during a Magic: the Gathering tournament. The conversation was with former world champion Katsuhiro Mori, who asked me why I was playing with such a basic deck when I could be playing with something more complex where I would have a bigger edge. What is the relation with poker? The past days I had been playing in an automatic way, without thinking much about the plays, only following my strategy pattern. The problem with this, was that I didn't attack the individual weaknesses of each player and that reflected on the results. When I realized that, I started thinking a bit more about each play and the results improved. 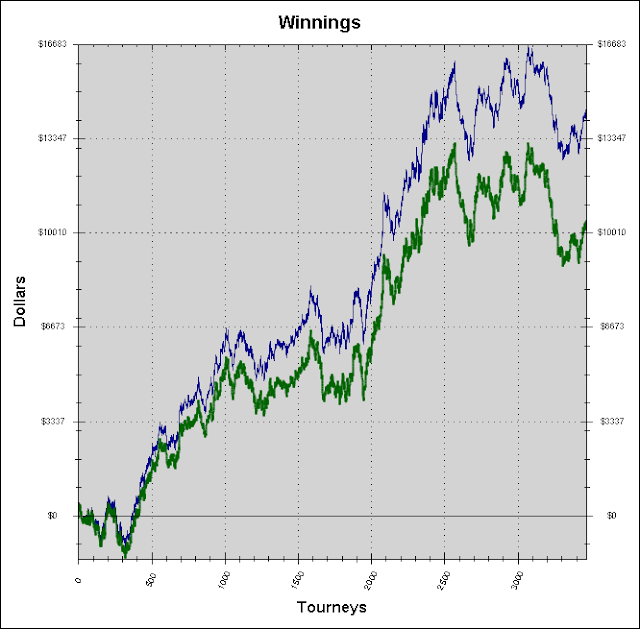 I finished the day a bit up and I was $15k positive at the end of 11 days of the challenge, so I was not going to worry much about the following four days since I was on pace. The following day I wasn't going to play much since I didn't expect to find many hyper-turbos running. I changed the graphic of holdem manager to "By Day", so that it will be easier to read. I played 8 hours and I had my first negative day of the challenge. I played some $220 tournaments that seemed to be more accessible, but I think that need to be more humble when it comes to games selection. I was checking sharkscope and many players that I don't know appear in the $220s and they are profitable players in the hyper-turbos. I thought I would try to be more careful in the future. I also got the idea that the games were more difficult comparing to the previous week. Could it be that the people playing were left without any money after one week of the scoop? 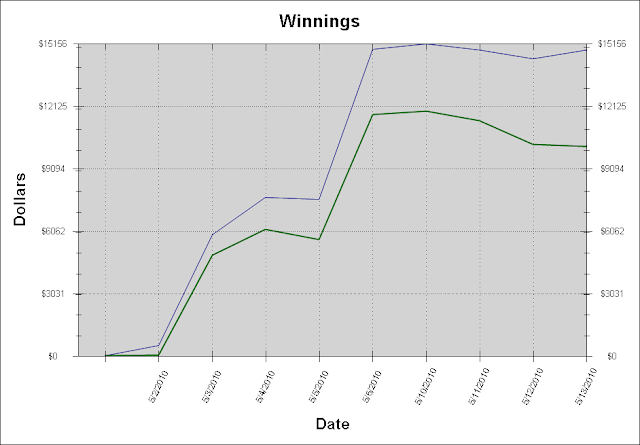 :( The biggest part of the games had 4-5 regular players, which could still be profitable after rakeback, but it wasn't good enough to allow me to win as much as I did during the previous week. P.S. : The day before I took some time in the morning to study! That day I only played 3 hours, I slept late and I had to catch a plane early in the following morning. I was going to France to play a Magic: The Gathering tournament. I continued playing the same tournaments as the day before, but on day 5 nothing remarkable happened. I also played the hyper-turbo satellites for the knockout tournament and the tournaments that had bounties! I loved playing these hyper-turbos and I'm sorry that sharkscope as well as holdem manager don't keep track of bounties. Holdem manager analysed these tournaments as if they were normal tournaments, that pay to the top3 and don't take into account the extra prize pool of the bountys. Counting the absurd quantity of bounties that I won, I think that they do count for me, but they won't make a significant impact considering the values of my challenge. This week there will be a tournament for my blog readers on Sunday 16th May, at 20:30 GMT. The usual prizes will be given, depending on the number of players. In addition to that, PokerStars will give to every player that makes the final table a ticket for the Sunday 1/4 Million that will be credited to his account during the week following the event. On day 4 I played 8 hours and was quite tiring, especially when I had the $130,5s, cause I was playing all the tournaments from $88 to $220 that were starting during one hour. This day, once again scoop tournaments did not go well. I played the HU one without intending to, I probably won a hyper-turbo for it and forgot to unregister, so I played it while being tired. In the other two, I lost during the first hands where in one the situation was set over set (999 vs KKK) and in the other one JJ vs AA. At the hyper turbos, I played the $55, $70, $80 and $90 again. I will stop playing the $55 ones, I think I'm affected by the structure since they only pay the first two places ( the ICM is different). In total, on day 3 of the challenge I played 4 hours, I had to do a livecast for PokerStars and an interview for a Portuguese newspaper. I was feeling extremely tired so I planned to cut down on the mtts a bit and put more effort to my challenge, because I felt that I couldn't play sngs and mtts in the same day. The only mtt that I was going to play would be Day16 of the Main event of $109 and $1050 and up to those I would try to take full advantage of the hyper-turbos that are more accessible than normal. I played 2 tournaments of the scoop this day, 6-max with rebuys. In the first one I got in the money, but I lost 55 vs ATo. In the other one, I lost 100BB deep with set over set (Jacks vs Kings) on the river where there was no possibility of a straight or a flush… I also played a $162 tourney (I won a satellite for this one :P) where I lost AQo vs AKo 30BB deep (as usual :P). 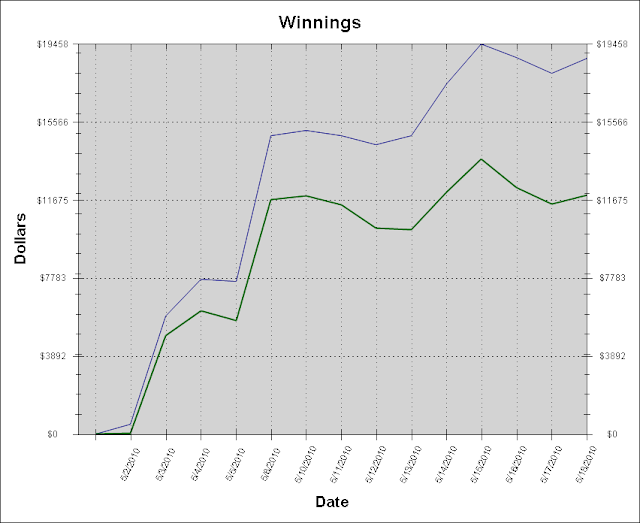 As for the hyper-turbos, I played the $55, $70, $88 and $90 stakes once again. I started off well, but wasn't anything special in the end. I played the hyper-turbos fewer hours than I should, but the previous day I had played 16 hours so I was keeping up with the pace. I was very, very tired, but I watched a film in order to stay awake and try to be competitive at the tournament that was starting at 3 am (Athens time). The results were fantastic, but unfortunately it's luck and they are going to eventually regress a bit. I played 2 tourneys of the scoop, but I lost in both. In the $22 one I tried to bluff a player with the nuts and it turned out bad, in the $215 I lost with a set vs flush draw+top pair on the flop. 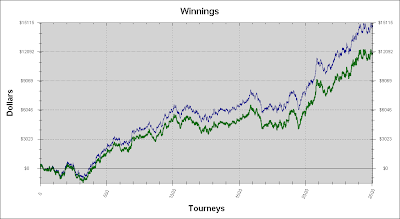 As for the hyper-turbos, I played $55, $70, $88 and $90, since there were a few running and I wanted to play as much as possible against amateur players (it's from them that comes the money). I don't feel the need to play high stakes, what I'm really interested in is how much I make per hour in a consistent way. This challenge is to show exactly that. I stopped having played only 7 hours, cause at that point the games died completely, but the results were great. I have planned an interview for J.N., that should be published on Friday. Feel free to join me and ask some questions! This week I was reading the blog of my team colleague Dusty "leatherass" Schmidt and in his last post he said that he was going to tend to win $100000 until the WSOP. It seems like a good idea to try to do something similar and share the experience with my blog readers. There are 60 days left until the end of June and in these 60 days I will try to get a profit of $60000, playing exclusively on Pokerstars. 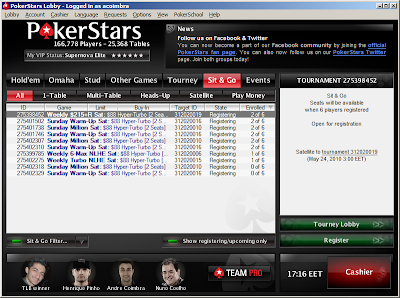 I will use my registration in holdem manager to control the balance of 60 days, because sharkscope doesn't include all the hyper-turbos and I want all the tournaments to count. I will take full advantage of the VIP system of Pokerstars and I will count all the money that comes from there such as Rakeback, that we will assume to be 63% of the Rake I spend at the games I play. This Rakeback will also count as profit. 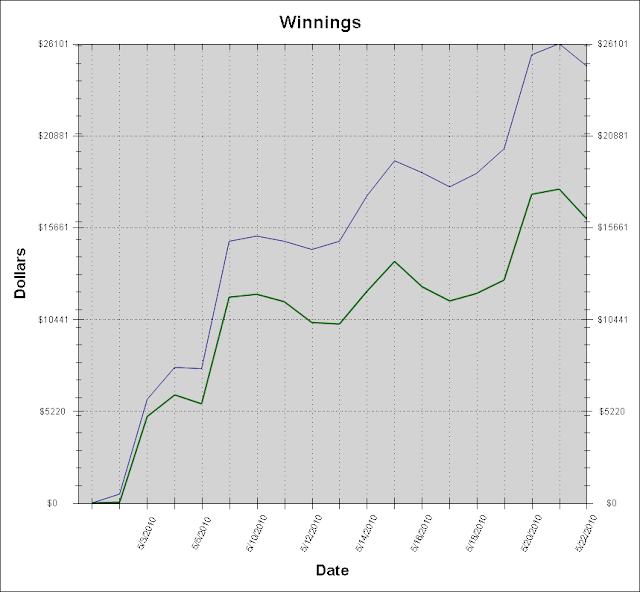 Everything that I play online will count, no matter if it's a sit-n-go, cash game or multi-table-tournament. This way, the only thing that I have to focus on is my hourly rate! I don't intend to play more than 40 hours per week, but it is likely to happen in the last days of June, in case I am slightly late for the challenge. I believe that the most important thing will be to study, since I have to increase my ROI (Return of Investment) a bit. Subscribe to my blog (it's a button on the top right of the screen) to follow me in this challenge!